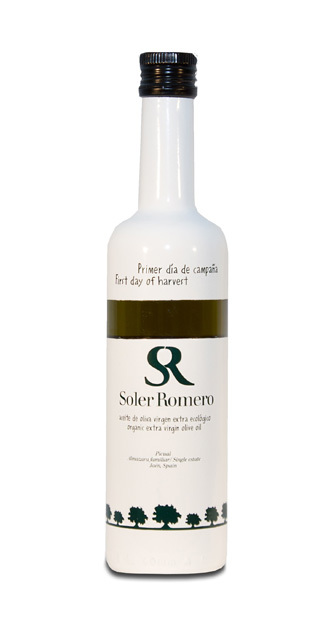 Soler Romero family has released a special edition First Day of Harvest oil, selecting best olives of the first day of harvest in order to capture the very most authentic flavours of the olive crop. The oil is of a green colour, which is characteristic of the unripe olives. It has been elaborated to shock you by the intense fruitiness of the green olives with touches of fruits like green tomato, artichoke, green banana and green grass. Its bold taste starts milder in the mouth, followed by progressive aftertaste of medium-high bitterness and peppery finish, which are in balance with the intensity of the green fruitiness. Due to its intensity a little splash of this olive oil makes the difference in your recipes. Ideal specially for dressing salads, vegetables and fish, and to spread over grilled bread. Fresh green olive oil full of sensations. The olives of first days of harvest (End October) have less content of fatty content, producing therefore less quantity of olive oil than the olives later harvested, however quality and tastes are enhanced to the maximum during the first days of harvest. Every harvest, a limited quantity of bottles of First day of harvest are available for our customers, ready to be served at the end of November. We recommend its reservation, "see photo".